There’s a reason women refer to their menstrual cycle as “The Curse”. According to WebMD, while half of all women experience pain and discomfort during their periods, 10% are temporarily disabled by their symptoms! Women experience a variety of symptoms while menstruating, from cramps to pain in the pelvis, lower back, and thighs. Vomiting, headache, dizziness, fatigue, constipation, and bloating are all common occurrences on the days leading up to and during the period. Extreme pain and menstrual cramps caused during the period are clinically referred to as Dysmenorrhea. Menstrual pain itself is a result of prostaglandins, which are chemicals produced by a woman’s body and are made by the tissue that lines the uterus. These chemical bundles of fun stimulate the uterine muscles to contract. Higher levels of prostaglandin may result in more intense contractions of the uterus, and thus more pain. Prostaglandin is most likely responsible for vomiting, diarrhea, and headaches, as well. Extremely severe pain can be the cause of more serious issues, such as endometriosis, fibroids, infections of the reproductive organs, and ovarian cysts, to name a few. While most women reach for a bottle of ibuprofen for cramp relief, painkillers are not permanent solutions to menstrual pain. Relying on painkillers can cause the body to develop a tolerance, resulting in a need for increased dosages and potential future issues. Certain lifestyle changes, such as adopting a low-fat, vegetarian diet and exercising regularly, can have profound impacts and bring menstrual cramp relief. Yoga is one of the rare side-effect free options for pain reduction available that can transform your period from a curse to an event. Yoga strengthens the body physically and aids in alleviating pain caused by menstrual cramps. By increasing the flow of oxygen to the body through the breath, circulation improves. Deep breathing facilitates relaxation of the body and mind, and when the body relaxes, pain subsides. Furthermore, studies show that yoga may increase pain tolerance, resulting in a greater ability to move through period discomfort with ease. So, want to know how to get rid of cramps? The following yoga poses can effectively limit the degree to which period pain hinders you from living your life. To achieve results, do the poses on a regular basis, especially on the days leading up to your period. Pigeon pose stretches the entire lower part of the body, stimulates the abdominal organs and relieves the body of menstrual discomfort. Begin in Marjariasana (Cat stretch). Breathe out and bring your right knee forward to touch the right wrist. Bending the knee, bring your ankle near the groin region. Now slide the right foot towards the left hand, till the toes touch the left wrist. Slide the left leg back so that it touches the floor. Keeping the knee straight, ensure that the front of the foot is touching the ground, while the sole faces the ceiling. Lower your right buttock to the floor and press your tailbone forward to lengthen your lower back. You may strengthen the lower back further by pushing your fingertips firmly to the floor. 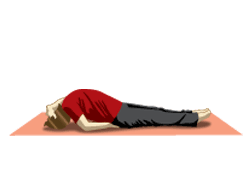 Take a few deep breaths in this position. 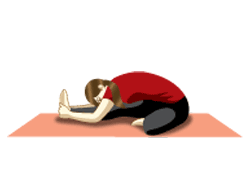 Slide your left knee forward while exhaling and get back into the Cat stretch. Stay in Cat stretch and take a couple of deep breaths, repeating the process with the other leg. Fish pose stretches and stimulates the belly muscles. Place the hands underneath the hips, palms facing down. Bring the elbows closer toward each other. Breathe in and lift the head and chest up. Keeping the chest elevated, lower the head backward and touch the top of the head to the floor. Now lift the head up, lowering the chest and head to the floor. Bring the hands back along the sides of the body. Relax. 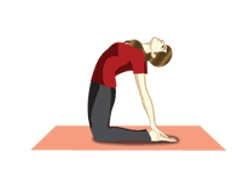 One-legged Forward bend is yet another pose that massages the abdominal organs. The pose also Stretches the lower back. Sit up with the legs stretched out straight in front of you, keeping the spine erect. Bend the left knee and place the left foot against the right thigh, keeping the left knee on the floor. Breathe in and raise both arms above your head and stretch up, and twist a little to the right from the waist. Breathe out and bend forward from the hip joints keeping the spine straight, directing your chin to the toes. If you can, hold onto your big toes and, pointing your elbows to the ground, move forward as you pull on your toes. Breathe out bring the arms down to the sides. 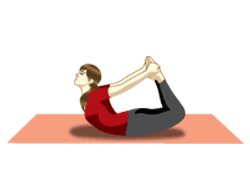 The Bow pose strengthens the abdominal muscles and stimulates the reproductive organs. It alleviates menstrual discomfort and constipation. Fold your knees and hold your ankles. Breathe in and lift your chest off the ground and pull your legs up and back. Look straight ahead with a smile on your face. Curve your lips to match the curve of your body! Keep the pose stable while paying attention to your breath. Your body is now taut as a bow. Continue to take long deep breaths as you relax in this pose. But don’t get carried away! Do not overdo the stretch. After 15 -20 seconds, as you exhale, gently bring your legs and chest to the ground. Release the ankles and relax. Cobra pose stretches and tones the abdomen. It also reduces fatigue and stress. Keep your legs close together with your feet and heels lightly touching each other. Taking a deep breath in, slowly lift your head, chest, and abdomen while keeping your navel on the floor. Keep breathing with awareness as you curve your spine vertebra by vertebra. If possible, straighten your arms by arching your back as much as possible. Breathe out and gently bring your abdomen, chest, and head back to the floor. Camel pose stretches and opens the front of the body and relieves the body of lower back ache. Kneel on the yoga mat and place your hands on your hips. Your knees should be in line with the shoulders and the soles of your feet should be facing the ceiling. Arch your back and slide your palms over your feet till the arms are straight. Practice these asanas throughout the month until your period begins. Once your period starts, practice pranayamas (gentle breathing), meditation, and simple poses such as Yoga Nidra. Avoid all rigorous physical and mental activity while menstruating. Pain-free tips to beat pain! No one wants to be debilitated once a month. However, it is important to remember that menstruation is a cleansing time of rest and renewal for the body. While the fast-paced modern world may perceive the period to be a “curse,” shifting perspective and seeing the period as a gift can have a profound effect on your relationship to your body and spirit. Take the time to give yourself the rest you need, and take advantage of the opportunity for introspection. Yoga is a holistic approach towards a physically and mentally healthy lifestyle. When practiced regularly over a period of time, yoga can have the desired effects on the body. However, if you are on any sort of medication, please consult your doctor before making changes. Yoga can be added to your routine in order to reach your goal of a pain-free period, but should not be used as the only means to get there. Respect your body, understand its limits, and have patience in overcoming them. In the meantime, dress up, enjoy life, and overcome the pain of your periods with a smile! Respect your body, understand its limits and have patience in overcoming them. In the meanwhile, dress up, enjoy life and overpower your periods with a smile!